I also struggled a bit with the “God makes us robots” argument. Have any of you run into a situation like this, and, if so, how did you handle it? God, in his kindness, allows all people to live on this life for their “best life now”. They can pursue that which their hearts desire to the fullest extent of that, until God directly prevents them from sinning beyond what he allows, or until he prevents their influence upon others. That said, God has placed the conscience in the hearts of all men, and they have to overcome this conscience in order to begin pursuing this desire to sin. No one is just free to sin without the knowledge of the consequences that are at hand. You have to push past your conscience time and again before it becomes comfortable for you to just continue living in that way, and the reason most people rile against the teaching of scripture is that it reminds them that they’re living beyond the bounds of their conscience. So no one stands uncondemned before God. No one is pure from sin in the eyes of God. Also, due to our sin nature, no one lives their lives in any way that’s pleasing to God. The 10 commandments aren’t a simple rule set for a life of blessing, but it’s God’s holy standard of perfection. This is his “you must be this holy to enter My rest” marker that stands before the entrance before the gates of Heaven, and only a life spent in constant obedience to that will allow you to enter. As James 2:10 says, to violate one point of the law, you have failed in all of it. More than that, no one, because of our self-focused, sin-sick hearts, would ever want to have a redeemer, much less would pursue this savior unless there’s a significant, personal pay off for that man. As we know from Psalm 51, the only sacrifice that God desires – the only one he acknowledges is one that comes from a contrite and humble heart. You cannot be truly contrite or humble if you’re coming to the throne of grace for how it will improve your life. If you’re looking for a salve for your conscience, or some kind of religious rite or procedure that will help you to balance out the sin you enjoy and the guilt you feel over it, then this is not the place for you. This is what the vast majority of Jews in Israel and Judah were pursuing prior to the Babylonian captivity and it led to their public humiliation and destruction. Since we know that the heart of men only ever seeks its own interests and comfort, and since God has provided to all men both the natural revelation around them which point to his existence and guiding hand in all of creation, and the conscience which lives in their heart, revealing their sin to them, the question about those who are clamoring for salvation and are “turned away” just doesn’t happen. Sure, there are many in the church who are there for their own benefit, but those are the ones who will be told at the last day, “I never knew you; depart from me, you workers of lawlessness” (Mt 7:23). God, knowing the hearts of men, and knowing that only those who enter the throne room of grace with a contrite and humble heart are those who are the ones who are there for God’s purpose and not their own, has chosen from the vast throng who are sprinting headlong into hell to interfere in the lives of his elect, to radically change the attitude of their hearts away from themselves and toward him, then to bombard them with his grace and mercy until they can do nothing but cry out in repentance and faith in the God and King of all creation who died in their place. The kindness of God allows sinners to pursue their own desires – their own dreams, despite the fact that they’re both living in rebellion to him, but also knowing that they’re doing it to their own hurt. It is therefore the God who interferes, the God of the “but God” statements in the Bible, who steps in and violates the autonomous rule of man’s heart to turn him to Himself for the sake of the sinner, and for the glory of the King of mercy and grace. You will say to me then, “Why does he still find fault? For who can resist his will?” But who are you, O man, to answer back to God? Will what is molded say to its molder, “Why have you made me like this?” Has the potter no right over the clay, to make out of the same lump one vessel for honorable use and another for dishonorable use? What if God, desiring to show his wrath and to make known his power, has endured with much patience vessels of wrath prepared for destruction, in order to make known the riches of his glory for vessels of mercy, which he has prepared beforehand for glory—even us whom he has called, not from the Jews only but also from the Gentiles? God has, by his own will and desire, created certain people for salvation and others for damnation. This is clearly seen throughout all of scripture, where man’s choices are overridden by God’s will. Jonah tried to run from his calling, but God forced his hand. Moses tried to shift the work of preaching to the people of God and leading them out of Egypt, but God forced his hand. He allowed Aaron to speak for him, but Moses didn’t know that he had already sent Aaron to him to meet with him for that purpose. The people of Israel said that they could keep God’s commands, but God in Deuteronomy 28 knew that they’d fall away and prescribed their punishment which they were to receive time and again to them. Saul wanted to crush the Christian rebellion against Jewish authority and Jesus forced himself upon him. Every time that there is a choice to be made, God is the actor on that choice, and it’s often not what people would have expected. Abel over Cain, Isaac over Ishmael, Jacob over Esau, David over all of his brothers, creating the people of Israel instead of choosing a large and well established nation. I could do this all day. The point made is that God is the one who chooses, but man merely responds to that choice. Look back at the covenants that we’ve seen – there are two types which are present. Covenant of grace, those which God provides onto a people (Noahic, Abrahamic, Davidic) and covenants of works, those which are doomed to fail, based on the people trying to keep their commitment with God’s commands (Adamic – led to the destruction of the world via the flood, Mosaic – led to the destruction of the nation of Israel). The covenants of grace were created because God chose to act for specific people in a specific way, but the covenants of works existed to point people back to God alone as our salvation and deliverer. Knowijng, then, that God is sovereign over his creation, and that we are part of that creation – not free moral agents who can do as we please, but subject to the will of the one who made, sustains, and controls all of the events and environment around us, who are we to say that God is unfair when he chooses to control those whom he will save and those whom he will send to hell? Moreover, if God does choose to send anyone to hell, and if he is truly a just judge, then how is it that people can sin at all? This is where we see the realm of “free will” and that which it can pursue. The only free will that God allows is that which leads to sin. Think about it – WAAAY back in the garden, if Adam and Eve did the will of God then they’d never have eaten the forbidden fruit. Literally any other action was following God’s commands, but that which led them to sin. If you break down the ten commandments, we are called to honor God only in all that we do and to trust in him alone for our needs, much less our salvation, and we are to treat others in a way that honors God, as we are his image bearers, as are those with whom we interact. So any free will choice we exert on others is a violation of those commands. For those who say that we can, of our own will, choose to do that which pleases God, scripture denies that right. and never see the pit. So it is God alone who determines who can be saved, and God also who determines how that takes place. That said, if God purposes to save anyone, as the commander of all spiritual and natural forces, he will keep that person alive and bend heaven and earth until they are converted. When you are so converted, it’s not because you are choosing one option from a billion others, but that God has so orchestrated all of the events of your life such that you can do nothing but choose him. And you’ll thank him for it for the rest of your life and on forever into eternity. In reading Jesus + Nothing = Everything by Tullian Tchividjian, I started to realize that the core motivation behind my penchant to gauge my walk with Christ based on my perception of the righteousness of others is based in nothing more than the graceless, moralistic legalism that my heart desires. I want to know that my hard work for Jesus is valued and that my ability to keep myself from sinning is something that’s of value to God and that he will be pleased with me when he sees me standing upright on my best day, free from the sins that kept me bound and separated from Him for so long. That view, however, completely misses the point of the gospel. The gospel says that I am wholly broken, unable to help myself. It is not my own ability that keeps me from sinning, but it is God’s work on my behalf that has redeemed me. My self-righteous attempt to justify myself by judging others and their walk with God based on my own standard of holiness is not bringing God glory, but it is sullying the name of Christ by implying that my ability to save myself is the real source of my salvation and that Jesus’ death on the cross is nothing more than a bus pass to the outskirts of glory but that my own works are the real binding factor that keeps me in God’s good graces. That view is sickening to God and it should be sickening to me. Who am I to stand before the king of all creation and tell him that my worth and my actions are of value to him? Who am I to judge another man’s servant? My value before God is imputed to me by God through His sovereign choice to save me from damnation. I am no better than anyone else and I deserve an eternity in Hell far more than others who trip through life only to pass through death’s door without acknowledging the God who created them. My righteousness is worthless if it weren’t based on Jesus’ active obedience. Because Jesus lived a perfect life, I am seen as perfect before God. The passive obedience of Jesus death on the cross merely paid for my sins – cleared my record of wrongs, but Jesus’ active obedience brought me into the throne room of God and placed on me the glory that He deserved. Hallelujah, what a Savior. As an essentially reformed Christian, I first heard about this book and thought it was another in the long line of recent attacks on Calvinism, or the Doctrines of Grace. As a man who fought through my own inclinations toward Arminianism and the free grace mindset that I was indoctrinated into as a child, I did not want to waste my time reading another book that levels the same tired old arguments against what I have found to be the accurate and true reading of scripture. Heck, when God first saved me in April of 2004, I was a well-researched and deeply rooted evolutionist. As proof of God’s amazing grace and His power to move mountains, He not only converted my very soul, but transformed my mind and I am a firm believer in creationism today. My walk out of Arminianism was, in the same manner, a long walk of redemption as I began to learn more and more about who God is, who I am in relationship to Him, and how I should respond to Him through the reading of scripture. I’ve fought every fight, thought through every alternative, and investigated every argument. The thought of reading yet another book on this subject was something that I wanted no part of. That was until I found out who has written the book. 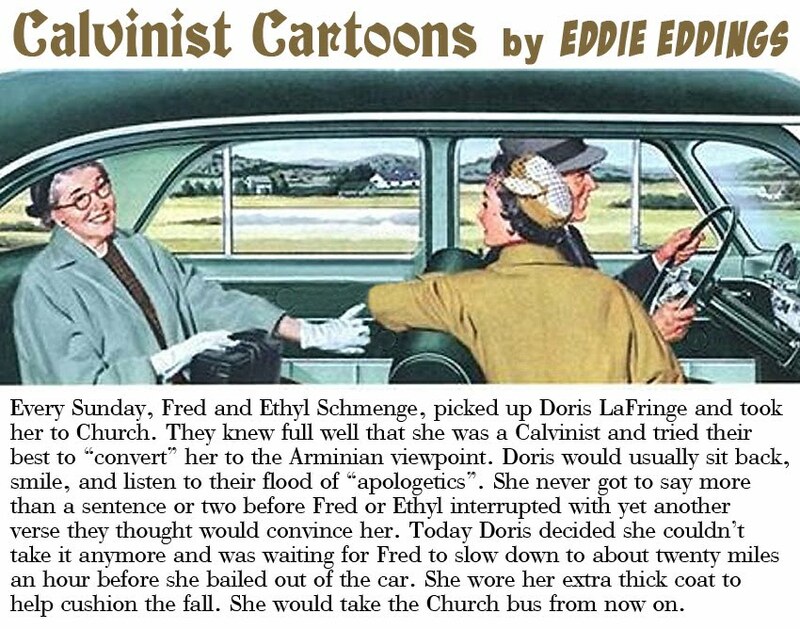 I had been following Eddie Edding’s site, Calvinistic Cartoons for the better part of a year and enjoying it daily. The Lighthearted Calvinist is a blog by Jeff Peterson, which I also frequent, rounding out the second of the three authors of this book. Given the insight present on the pages of these websites has led me to an interest in reading the book that they had authored. I found this book to be a concise and thorough defense of the Doctrines of Grace. It defined the principles and stated clearly the history of both John Calvin’s views and those of James Arminius as well as the actions of their followers that have led to this debate. The authors then stepped through and biblically defended each of the five tenets of Calvinism, then rounded each chapter with humor and wit. I firmly stand behind this book and recommend it to anyone who would like to have a reference available to them that cleanly and precisely builds a defense for the Doctrines of Grace.